We spot our blog on telly! 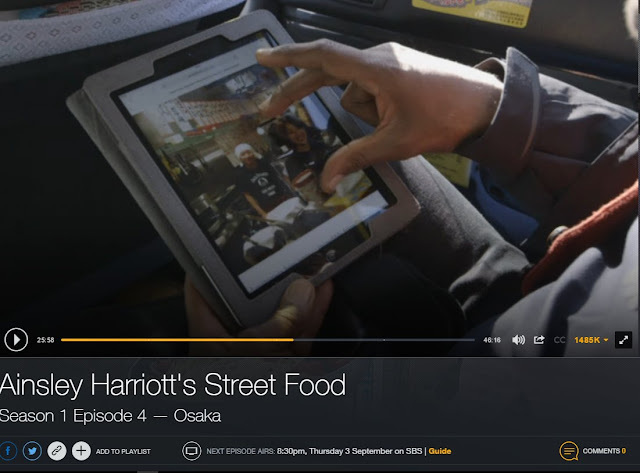 We're rather excited to stumble upon the episode of Ainslie Herriott's Street Food which features our favourite Japanese city, Osaka. Then we're doubly excited to see Ainslie visit our favourite little neighbourhood in Osaka, Fukushima. We thought Fukushima was our little secret. In the taxi to Fukushima, Ainslie scrolls through some photos on his tablet. Hang on, we know that photo - that's our blog! (See the incriminating post here). There's only a flash of it, and it's just b-roll, but it's there. To get a screen grab we had to rewind/fast forward like a 1990s teenager watching Basic Instinct. To top it off, Ainslie visits our favourite izakaya in our favourite suburb in our favourite city in Japan. We're heading back to Osaka in a few weeks, staying in Fukushima as always, can there be any better good holiday omen? Congratulations! Very keen eyed viewing too! Congratulation, you guys have made it to the telly famous list. How did you even manage to find that vid? !